The Tel Aviv residence of Canada’s ambassador to Israel hosted last Thursday evening, March 30, an event organized by the Transitions Organization for the Trans Community in Israel, to mark this year’s International Trans Day of Visibility. This day, which is officially celebrated around the world every year on March 31, celebrates the lives of the members of the trans-sexual community and people who are different their gender orientation, and emphasizes the value of the Trans community as a significant part of society. 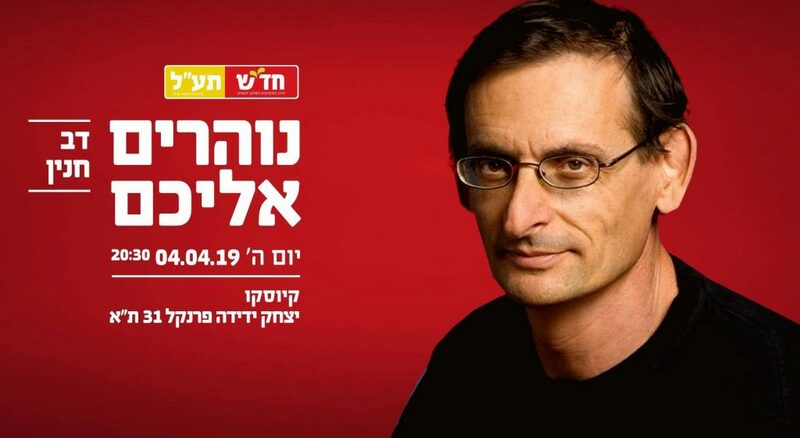 An invitation to a public meeting in support of the Hadash-Ta’al electoral campaign with Hadash MK Dov Khenin to be held at the Kiosko café, 31 Frenkel Street in Tel Aviv, tonight (Thursday, April 4) at 20:30. During the event, the Israeli organization presented an award to Hadash MK Dov Khenin for his advancing the rights of the transgender community in Israel by promoting legislation for the benefit of that community. It was Khenin who led the amendment of the Student Rights Law, which now states that “local education authorities, educational institutions or any person acting in their name will not discriminate against students for reasons of sexual orientation or gender identity, either of the child or their parents.” This is the only law in Israel that provides protection against discrimination based on gender identity. Docaviv, the Tel Aviv Documentary Film Festival, announced on Monday, April 1, the names of the 15 films which will be participating in its upcoming competition opening on May 23. Among the films to be screened in the festival, 12 are world premieres, among them is the new film by Barak Heymann Comrade Dov, which follows leading member of the Communist Party of Israel, Dov Khenin.